Brunch is big in L.A., but it’s rarely surprising. The general trend these days is to serve basics with a twist—a little salmon here, a bit of bourbon there—while saving more innovative energies for the distinguished dinner hour. 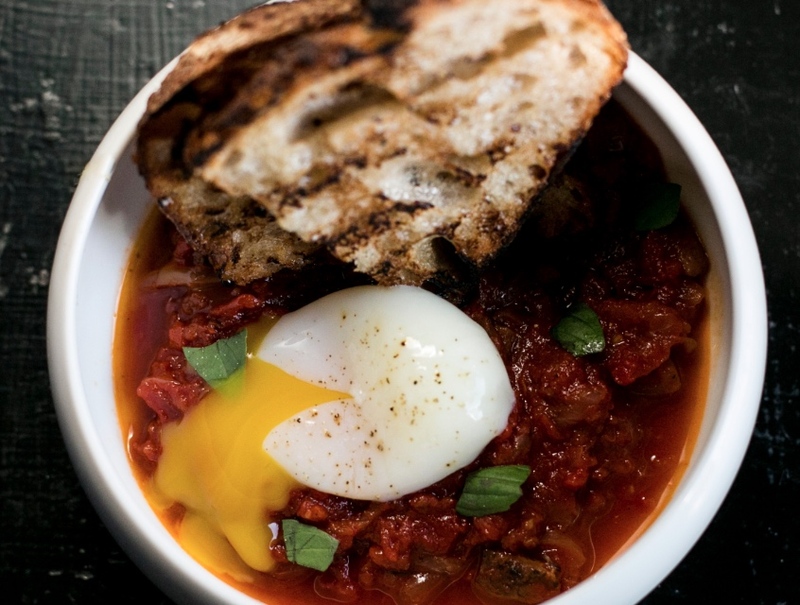 At Osso, the chefs are taking a different approach. You won’t find pancakes, benedicts, omelets, or french toast on the Downtown hideaway’s new weekend brunch menu, but you will find bowls of purple barley topped with pickled vegetables, braised swiss chard panade, and a crispy potato terrine. “We did try to make a unique menu and avoid the things you might see at pretty much every other restaurant that serves brunch. We certainly do understand that people want that, and there are several places that already make excellent versions of all of those things,” says chef Nick Montgomery. He adds that the menu, created by Montgomery and co-chef Akira Akuto, was designed to offer something a bit different while also reflecting Osso’s specific cooking style. Global influences pop up throughout the menu, and Akuto says the Fermented Potato Bread is a “straight up homage slash crib” to a dish served at Amass, chef Matt Orlando’s celebrated Copenhagen restaurant. To prepare Osso’s version, potatoes are cooked, milled, and salted. After fermenting (for a period of time longer than the chefs wish to share), the potatoes are mixed with flour, yogurt, and more salt. Each bread is rolled to order. “The grilled scallion yogurt dip [that we serve with the bread] just made sense to us to complement the yogurt that was already in the dough. 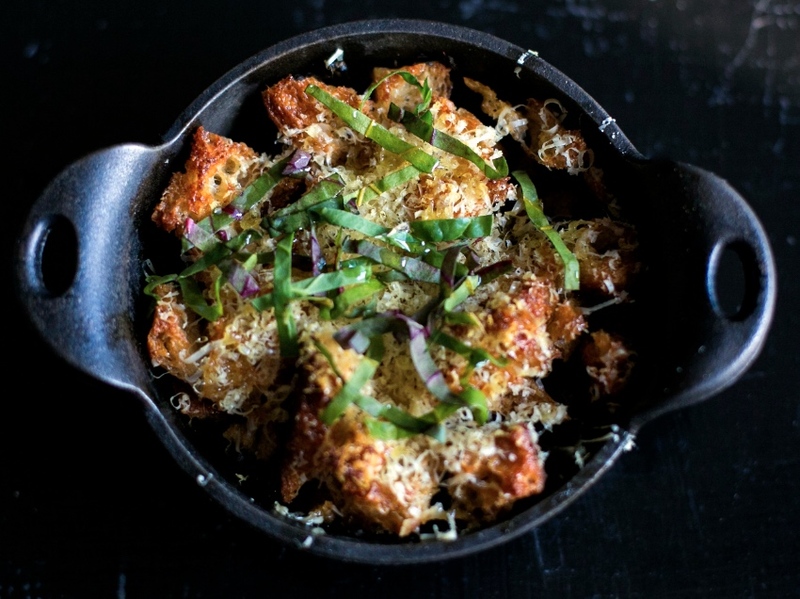 And we both just love grilled scallions and thought a good hit of acid would be nice to cut through fried dough,” says Akuto. But while they really get crafty with the fermented bread and bastardized pasta dishes, the chefs are keeping it classic with sides like bacon, sausage, and simple sourdough toast with housemade butter and jam. 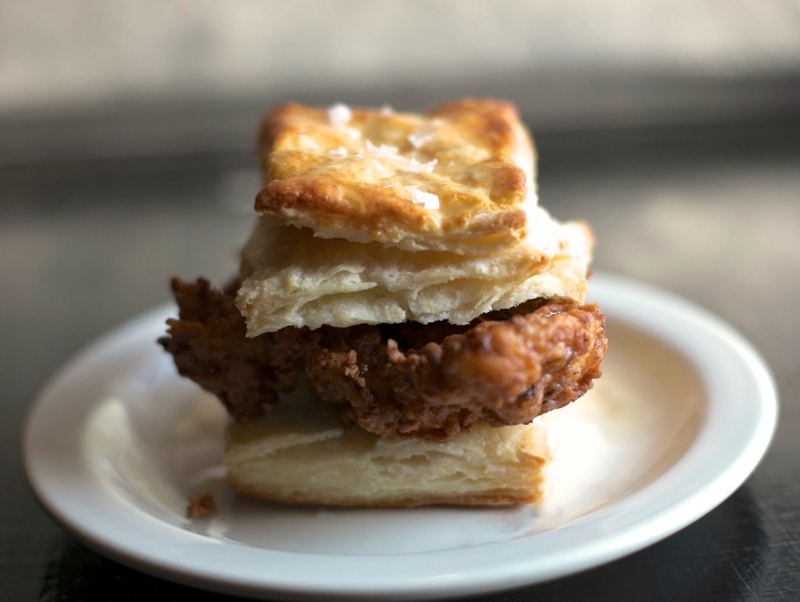 They’ve also added their crowd-pleasing fried chicken to the menu by way of a chicken biscuit sandwich dressed with chili vinegar and honey butter. The drinks run the gamut, too. Iced barley tea and spicy tamarind celery soda share the menu with fresh-squeezed orange juice and cold-brewed coffee. A charred cinnamon horchata also shows up, au natural and in head bartender Jordan Young’s Cheshire Cat cocktail, which also includes orange-infused vodka. Brunch is available Saturday and Sunday from 11:00 am – 2:30 pm.